'Nduja is a spreadable, spicy, red pork meat that can be found everywhere in Calabria. The sauce is produced from the throat of a pig, the guanciale meat, mixed with the back fat. This meat and fat mix is ground with salt and, of course, Italian chopped chili peppers. 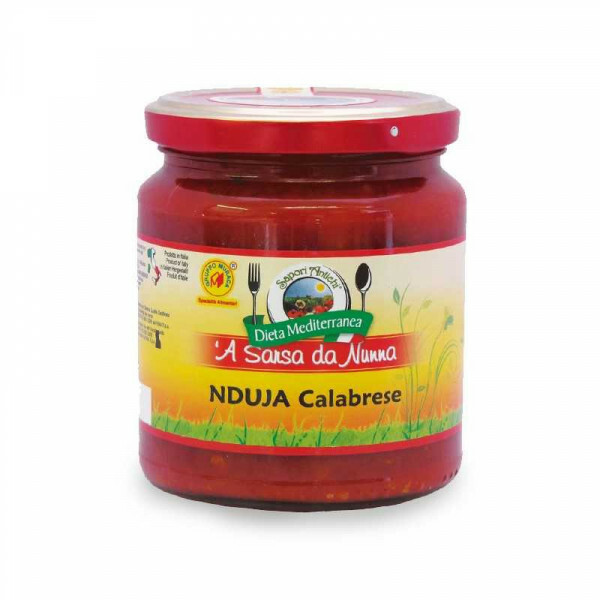 'Nduja 60%, sunflower oil 30%, chilli pepper 10%, preservatives E301, E250-E252. Spread it on toasted bread or use it as a base for a stew or in a pasta dish with shellfish.